In this work, the woman in the white dress dominates the visual field of the photograph, while the three other prominent male bodies seem to circle around her. The three repeating tuxedos, each representing a sort of “wealthy every man,” lean or move to the right, while the glamorous, diamond-studded woman shifts her hips and perfectly coiffed head to the left. She embodies a posture of chic allure, showcasing her as a modish icon in an already exclusive event. 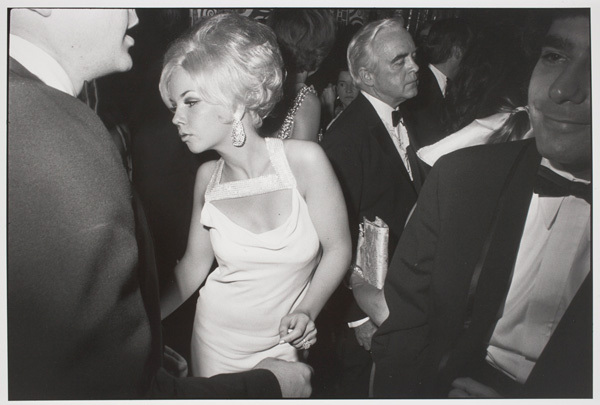 Winogrand took several photographs at the 1969 Metropolitan Museum of Art Centennial Ball. Interestingly these photographs were not only published in the context of Women Are Beautiful, but others also in appear in his series Public Relations. The most critically acclaimed of his books, Public Relations is a project Winogrand began in 1969 when he was awarded a second Guggenheim Fellowship. Proposing a thesis that most news is made news, his goal was to photograph “the effect of the media on events.” These happenings included parades, award ceremonies, protests, benefits, press conferences, and any other occasions in which the media were called to participate. He explored the way in which the media’s presence serves to create the event; further, he emphasized that reportage fixes the value and importance of the participants.